Our Caterpillar BB621E Paver Finisher. We the Surfacing Company Ltd have now added a Caterpillar BB621E Paver to our fleet. Recently our clients have repeatedly requesting a smaller paver than we have been able to supply. Our Caterpillar BB621E has a small footprint and is perfect for areas with limited access. The purchase of a Caterpillar BB621E strengthens our fleet by allowing us to offer a comprehensive service in particular areas such as Underground Carparks, Footpaths, Cycleways & Trench reinstatements Together with our expansive fleet of Surfacing Plant we feel that it further reinforces why The Surfacing Company Ltd is your ONLY choice when it comes to surfacing works. 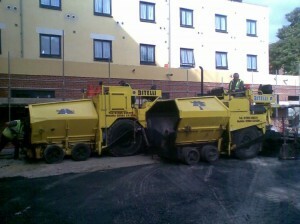 Available for Paver Hire with Operatives or part of full surfacing solutions tailored to suit your needs.